First published in 1921, as the second edition of a 1917 original, this book was based on a series of lectures delivered at the University of Calcutta during 1912. 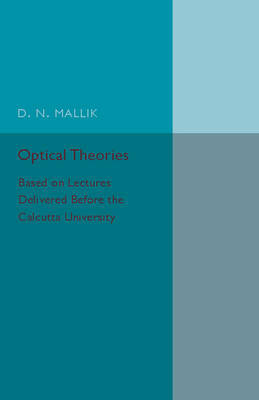 The text presents an account tracing the development of optical theories from their beginnings through to the time of publication, incorporating information on the relationships between different theories. The chapter titles are as follows: 'Early speculations, corpuscular theory, undulatory theory'; 'Elastic solid theory'; 'Electro-magnetic theory'; 'Theory of relativity'. This book will be of value to anyone with an interest in optics, physics and the history of science.